We started our day at 5:50am (was supposed to be 5:30am but we snoozed twice – opps) and we left the house around 6:30am. Now for us Alton Towers is around an hour and a half to two hours depending on which one of us is driving. Which meant that we did arrive just after 8am. To most people this is super early as the park doesn’t open until 10am, however for MAP (Merlin Annual Passholder) or hotel guests there is an early ride time from 9:30am. You may be thinking 8am is still super early but this is opening day, due to be super busy! We decided to ‘treat’ ourselves and go in the express parking so that we didn’t have to walk far. We got into the queue around 8:20, and it VERY quickly built up behind us. The queue went back to the monorail station and started bending round towards the car park, so we were expecting a very very very busy early ride time!! At around 9:15 some staff and mascots came out to the front of the park to open the park for the season (including using confetti guns). It was about 9:20 when we were let into the park. 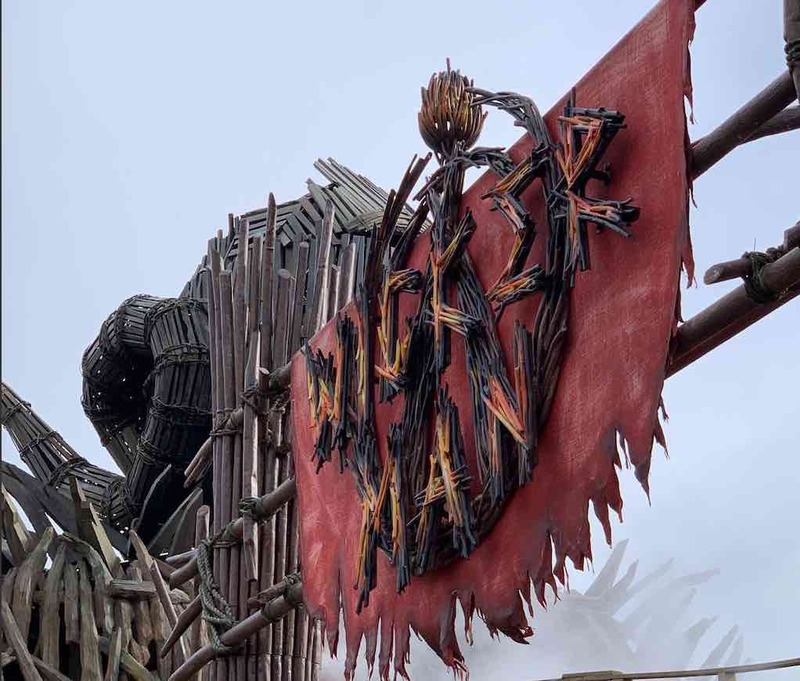 Given that every single time we went to Alton Towers last season Wicker Man did not open on time once, we didn’t have high hopes for the opening day. To our surprise we were being let into the queueing system for the ride at 9:28am!! This was a good sign of things to come for the day. Wicker Man is a great ride but gets busy and stays busy all day long, so try to ride it first thing or make it the last ride of the day. 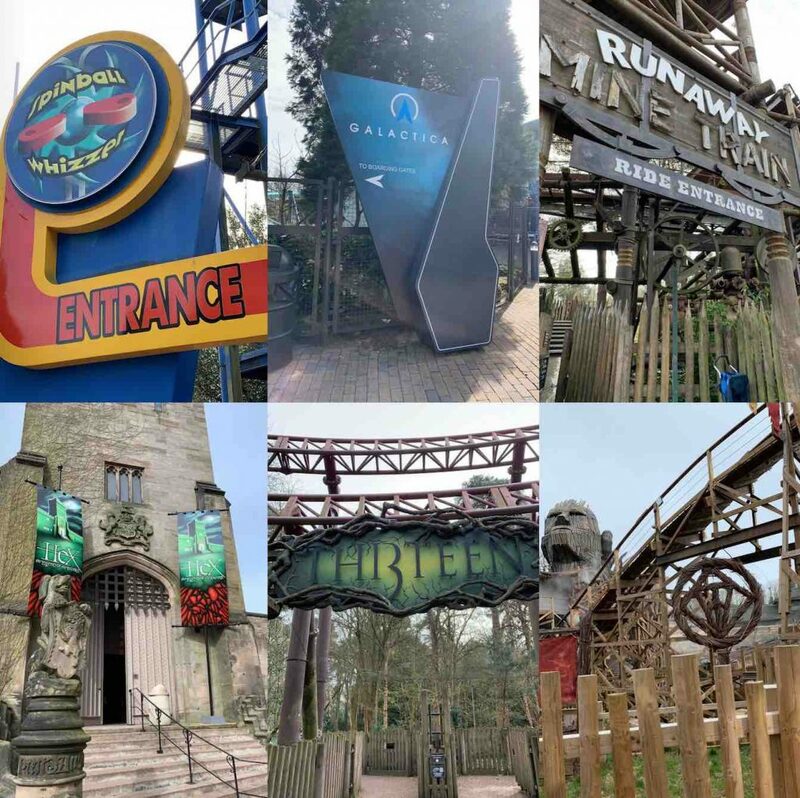 We noticed on the app (get the app, it really helps with looking at the queue times and planning your next ride) that Alton Towers was using staggered opening times again. We love this because you can be at the front of the queue for rides opening at 11am after having been on your first ride. So we took a casual stroll (normally its a fast walk but thats usually due to Wicker Man not opening till like 10am or later), up to Thirteen. Thirteen is a great ride! We love this ride, despite having been stuck on it in the past. We actually had to wait for more people for the ride as you need a minimum of 18 people for Thirteen to run! Nevertheless enough people turned up within about 5 minutes and we ended up riding it twice. We did our usual and went straight onto Hex, an old ride but it is a really good one and always hurts our heads to think about how it works! We always do Hex after Thirteen because they are so close to each other. Since we were feeling hungry, we took the long walk up to the Pizza and Pasta Buffet but before going in we went on the Runaway Mine Train. We enjoy this ride a lot, however we always have issues trying to get the photos from this ride. The queue was out of the queuing system, however it was only about a 10 minute wait tops! We then went for lunch. 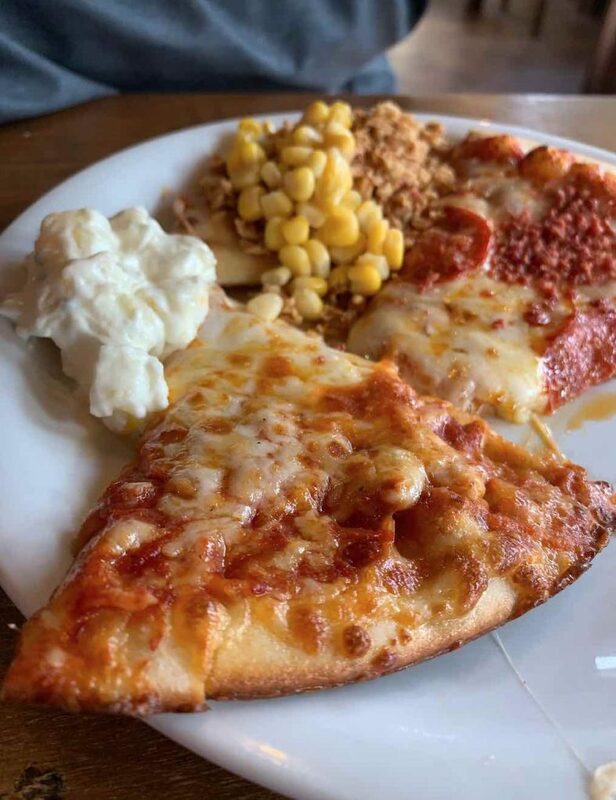 The system for the Pizza and Pasta Buffet has changed, and you now pay before you are seated, which saves a lot of time. Though they no longer make the chicken and sweetcorn pizza (which is what we go for) and the alternatives aren’t all that great, margarita, hawaiian, beef and pepperoni. So we were a little disappointed there. We really wanted to go on the Congo River Rapids, but they didn’t open at all (so we will have to go back to go on them). From lunch we headed towards Nemesis and Galactica, but stopped off along the way to go on Duel. Duel is a shooting ride and is great after lunch because it doesn’t make you want to be sick. Nemesis (we noticed on the app) had a short wait time of 20 minutes so we went on that next. I really like the queue and the fact theres a couple of waterfalls next to the queueing system for Nemesis. We both always find it very odd that there are no staff members directing people to rows for this ride, which means that there are always loads of empty seats as people don’t want to sit next to strangers (even though it makes absolutely no difference to the ride). Now for Galactica… Well, this was one of the longest waits we’ve ever had for a ride at 40 minutes (ended up being about 45 minutes). We think the ride went down as we got into the queue as there was no movement for ages and then we noticed that the ride was being sent round with no one on it. They have removed the VR headsets from Galactica now (thankfully because they were rubbish). Surely this just makes it ‘Air’ again though?? Since we had been on almost everything we wanted, our final ride (as always because it makes me want to throw up) was Spinball Wizzer… However, when we approached we noticed everyone walking out of the queueing system and staff clearing the area. So we walked just outside of the area and sat down to wait and see how long it would be before we would be allowed back in. It wasn’t long (about 10 minutes maybe) before we were allowed to go in and get into the queue. We must have been about 15 minutes back in the queue, but due to my excellent eye sight and hearing I heard the staff shouting for a party of 2… Thats us! So we walked straight through and on to the ride and ended up being in the first car to go round the track. Always keep an eye out for this happening when you’re queueing. Since the queue was still really low, and this was the last ride we wanted to go on for the day we decided to go back round and go on it again. If only it were that simple! We queued, waited, got onto the ride… We were about to leave the station, or so we thought. We were just sat there for a while before a member of staff told us that the ride had broken down and that they would let us off. It’s standard practise at Alton Towers that if you are waiting long enough then they will give you a fast pass to use. But our wait wasn’t that long and we were on the ride again. After all of this we decided we had done all the rides that we wanted to do and so it was time to head home, VIA the shop on Towers Street. 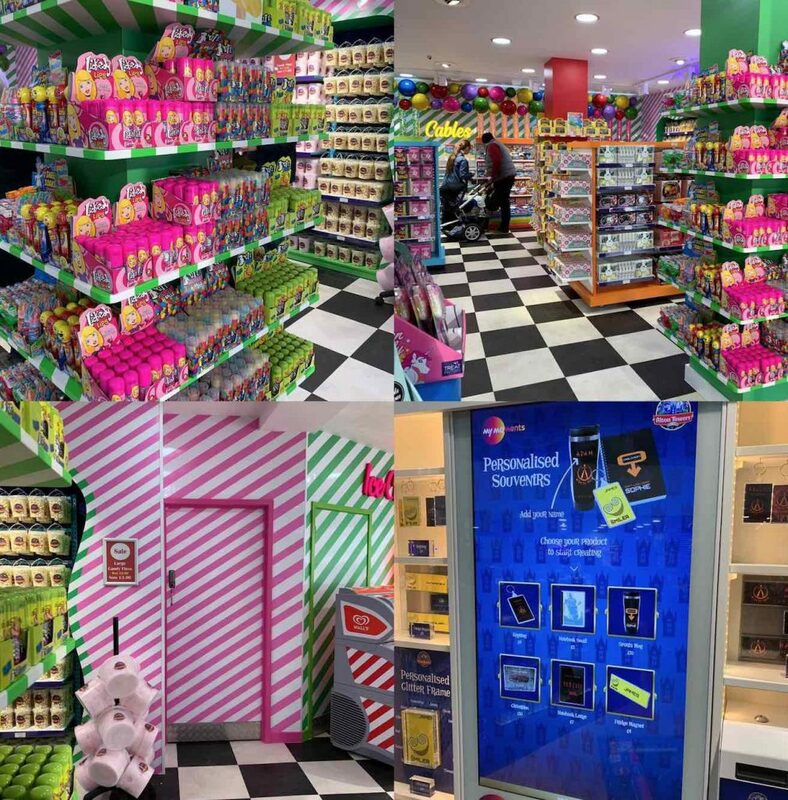 The shop has had a make-over and looks much better and brighter now, it also now includes a personalise your merchandise machine! We didn’t try it but it does look really good. All in all it was a very good day, only one ride broke down whilst we were on it and we didn’t get stuck in many queues. We actually left the park before 3pm as well (it was open till 5pm). If you want to make the most out of your day then check out our previous post. Don’t forget to follow us on Instagram and Twitter to see what we are up to! Next Next post: Gandeys Circus 2019 – The Greatest Show. I’ve never been to Alton Towers (I’m a bit of a wuss about rides since I worked in a theme park) but the app is such a good idea! I wish Disneyland Paris had had something like that when we went a few years ago.